This is what’s currently in our biscotti bin: Mincement & Walnut Cantucci. As an American, the first time I heard the term “mincemeat” was probably from dialogue in a cartoon of some sort, maybe Popeye. Luckily, a visit to the British Isles sometime in my late teens fixed that, and I got exposed to mince pie. YUM. Still, I’d never baked with it until last week. You can buy mincement in a rather large jar, or in a condensed vacuum pack, which is what I chose when the recipe called for a fairly small amount. These cookies are quite tasty, even though they are cantucci of the butter variety, so they are softer, but not as crunchy as I generally prefer. 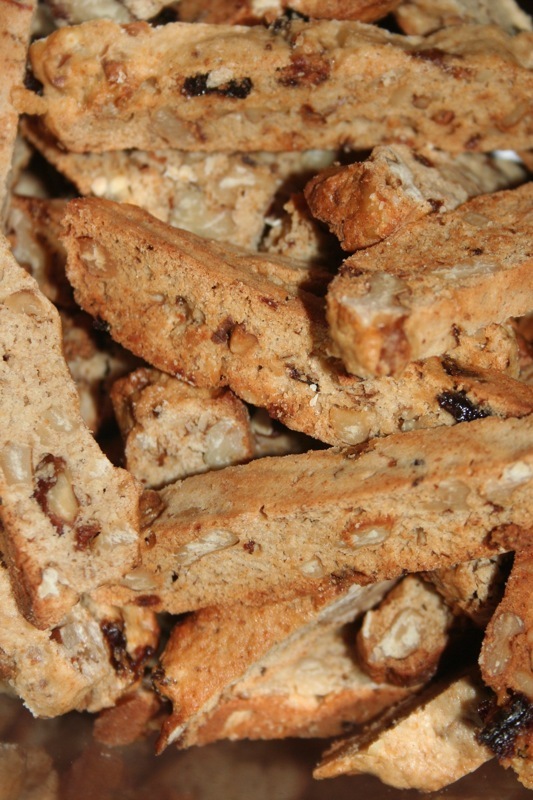 For these, I adapted the recipe of the same title, in The Best 50 Biscotti Recipes. This little cookbook has a nice collection of pretty creative concoctions.